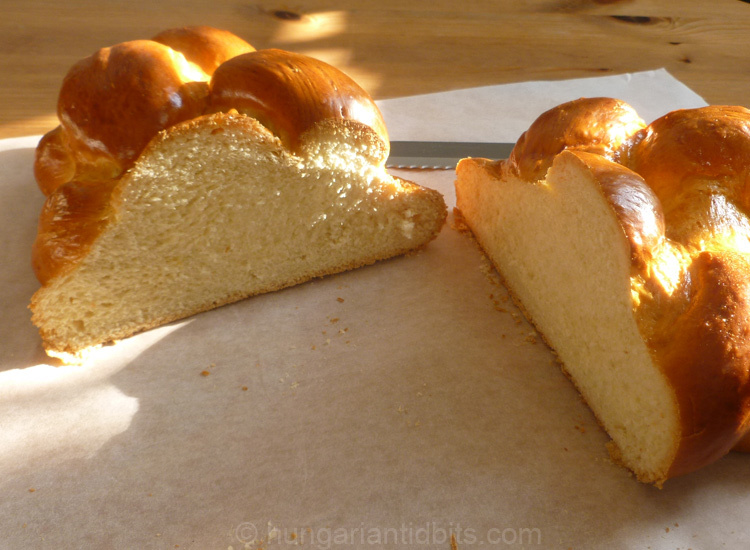 This light sweet plaited loaf looks fabulous on the Easter table and is often paired with savory ham slices and cooked eggs. They are also great simply buttered with jam. It’s a yeast dough slightly sweetened with sugar. Fat is introduced in the form of cream and full fat milk here to get that flaky fluffy texture. 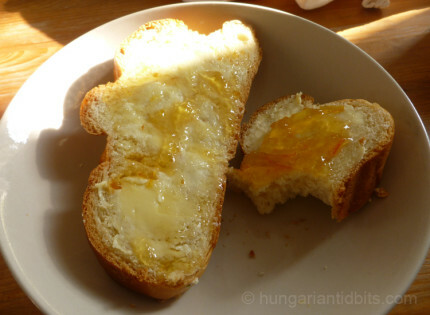 Having never made this before I closely followed the recipe of a Hungarian gastro blogger lady, Limara, who is the undisputed Hungarian Queen of baking, her blog in Hungarian is here. 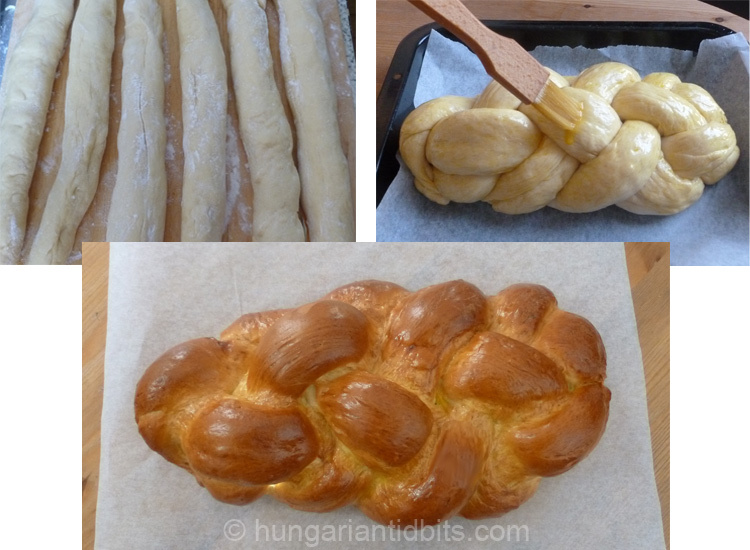 The bread is shaped by braiding rolled out dough strands together. I attempted the technique of the 6 strand braid, which makes a nice pattern. It started well but towards the end just improvised best as could, still got a nice loaf, even if not as neat as could have been. If you are using a bread machine, pour in all the room temperature ingredients and make a nice smooth dough then carry on from point #5 below. Start off the yeast by warming the milk lightly, mix in a teaspoon of sugar and a little flour. Crumble the yeast in and set aside at room temperature, when it starts to bubble and rise, it’s ready. Measure the flour into a large bowl, break up any knots by stirring with a fork, even better, sift it beforehand, mix with the salt and sugar. Make a well in the middle, add the rest of the ingredients; the eggs, cream, and the yeasty milk – all has to be room temperature, so take the eggs and cream out of the fridge in advance. Combine the ingredients, once forming a dough start kneading, first in the bowl then take it out in one ball and work on clean flat surface lightly dusted with flour. If it’s sticky dust a bit more flour and work it in, if too dry and crumbly, combine with a splash of milk. After 10-15 minutes should arrived to a smooth springy shiny dough that doesn’t stick to hands or the work surface. Oil a medium-sized mixing bowl and place the dough into the bowl. Cover with cling film and set aside to rise at room temperature for 30-35 minutes, it should nearly double in size. When risen, turn the dough out onto a lightly floured work surface and knead to knock the dough back. This will result in finer texture at the end. Shape the dough into a ball. Divide the dough into six equal pieces or as many as you need for your selected style of plaits. Form neat doughballs, cover with a clean tea towel or a larger bowl and let them rest for 10-15 minutes. Roll out each piece into a strand about 40cm/16in long. Lay the strands out on the lightly floured surface like an octopus, fanned out from a central point at the top. Stick all the ends at the central point to the table with your thumb. Begin braiding according to the video below or your style. Transfer the loaf onto baking tray lined with parchment paper and preheat oven to 170°C (325°F). Wash the loaf with a beaten whole egg, then let it rest for another 30-40 minutes at room temperature during which it should grow in size. Brush with the beaten egg the second time. Bake in a preheated 170°C (325°F) oven for about 40 minutes. Made this yesterday. Couldn’t believe there wasn’t any butter, but turned out beautifully! Happy Easter Shirley! Nice to hear the recipe worked well for you as well. I will make this again in future.